SCVHistory.com LW2119a | Rancho Camulos | National Historic Landmark Celebration, 2001. 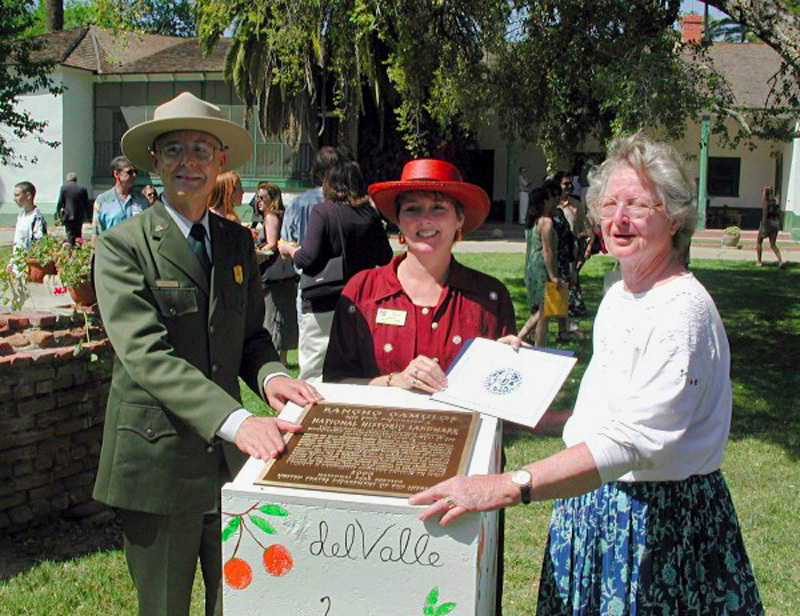 May 5, 2001 — National Historic Landmark Dedication Ceremony at Rancho Camulos. Actual designation as National Historic Landmark came a year earlier, on Feb. 16, 2000. From left: Arthur Eck, Superintendent, Santa Monica Mountains Recreation Area, National Park Service; Kathy Long, Ventura County 3rd District Supervisor; Shirley Rubel Lorenz, President, Rancho Camulos Museum Board of Directors. Ygnacio del Valle established Rancho Camulos in 1853, on part of a Mexican land grant of former mission lands. Rancho Camulos was the setting for "Ramona," an 1884 novel that generated national interest in the history of Hispanic settlement in California. August Rubel purchased the property in 1924 and preserved the significant historic features of the site. Ygnacio del Valle estableció en 1853 el Rancho Camulos en lote de tierra donada por el gobierno Mesicano procedente de las antiques tierras de la mision. Rancho Camulos fue el escenario de "Ramona," novela de 1884, que generó interés national; en los asentamientos Hispanos en California. August Rubel compró la propreiedad en 1924 y preservó el significativo patrimonio histórico del lugar. LW2119a: 19200 dpi jpeg from smaller jpeg of digital image by Leon Worden.